Facebook is running sponsored content in The Telegraph that comprises positive stories about the social media giant. The series of print and online articles, entitled "Being human in the information age", is produced by Telegraph Spark, the newspaper’s paid content division. The online articles do not explicitly state that they are paid for by Facebook. Instead, there is a logo that reads "Brought to you by Facebook" and articles end with a paragraph stating that Telegraph Spark and Facebook have "teamed up to show how Facebook and other social media platforms are harnessing the power of the internet to protect your personal data". Headlines include "We want to make Facebook safe for everyone" and "Why Facebook’s mission is to bring the world closer together". A Facebook spokeswoman told Business Insider, which first reported the partnership, that the promotions were part of the company’s wider marketing efforts in the UK. 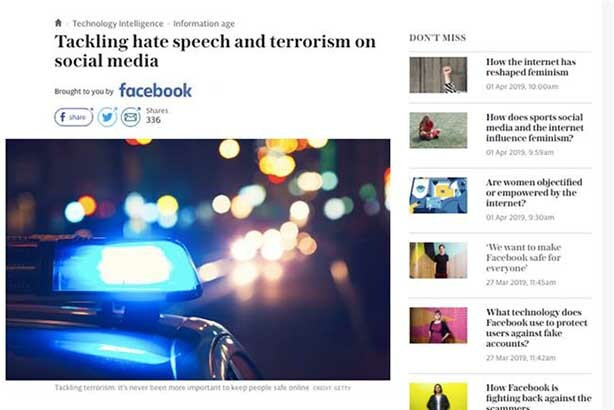 On 13 March, The Telegraph ran a story called "What action is Facebook taking to tackle terrorist content? ", which promoted how Facebook uses artificial intelligence to detect pro-terrorist material. Two days later, Facebook was used to live-stream a terrorist attack in Christchurch, New Zealand, in which 50 people were murdered. In 2015, the newspaper's editorial values were called into question by former columnist Peter Oborne, who resigned in protest over The Telegraph's lack of coverage of an HSBC tax scandal. Oborne said The Telegraph’s coverage of HSBC, a major advertiser for the newspaper, was a "form of fraud on its readers".